Please refer to the create_engine documentation for more information. Cube has to have key property set to the fact table key column to be able to provide list of facts. Default key is id. One of the important parts of proper OLAP on top of the relational database is the mapping of logical attributes to their physical counterparts. In SQL database the physical attribute is stored in a column, which belongs to a table, which might be part of a database schema. For example, take a reference to an attribute name in a dimension product. What is the column of what table in which schema that contains the value of this dimension attribute? For data browsing, the Cubes framework has to know where those logical (reported) attributes are physically stored. It needs to know which tables are related to the cube and how they are joined together so we get whole view of a fact. There are two ways how the mapping is being done: implicit and explicit. The simplest, straightforward and most customizable is the explicit way, where the actual column reference is provided in a mapping dictionary of the cube description. 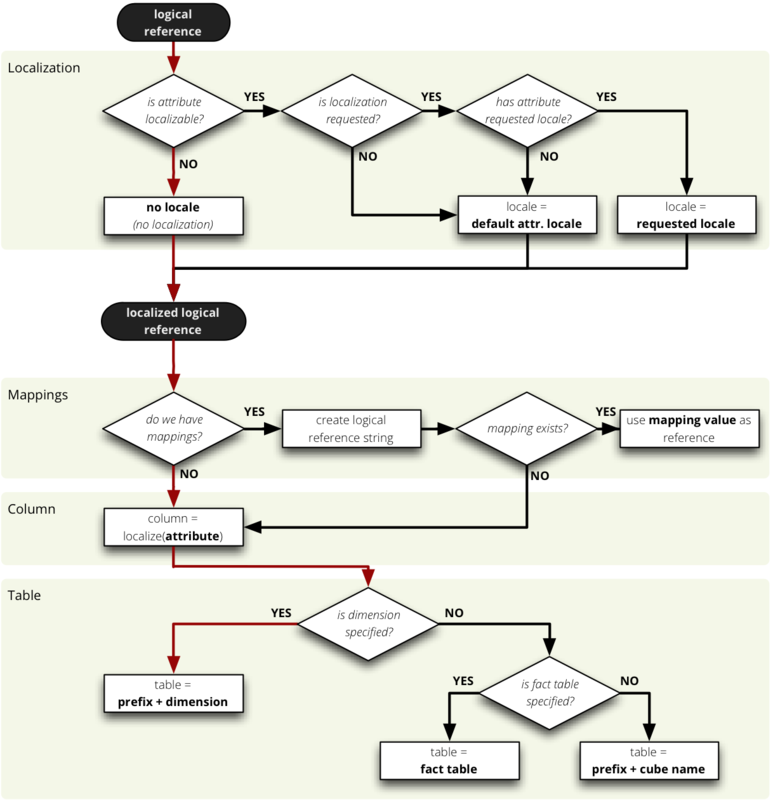 With implicit mapping one can match a database schema with logical model and does not have to specify additional mapping metadata. 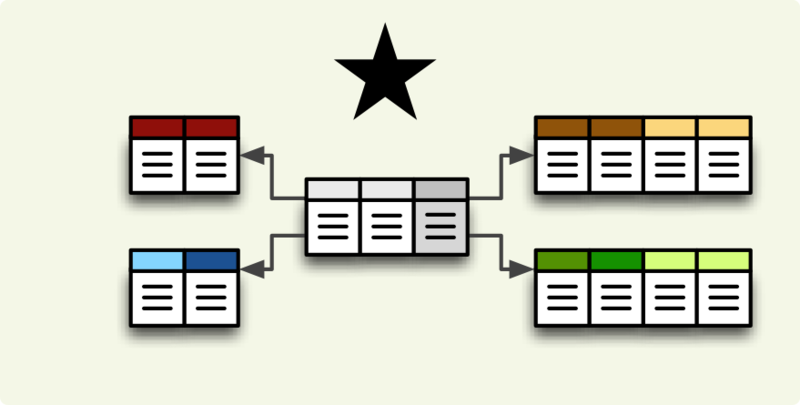 Expected structure is star schema with one table per (denormalized) dimension. Cube is named contracts , framework looks for a table named contracts . Cubes are named contracts , invoices and fact table prefix is fact_ then framework looks for tables named fact_contracts and fact_invoices respectively. It is quite common practice that dimension tables have a prefix such as dim_ or dm_. Such prefix can be specified with dimension_prefix option. What about dimensions that have only one attribute, like one would not have a full date but just a year ? In this case it is kept in the fact table without need of separate dimension table. The attribute is treated in by the same rule as measure and is referenced by simple year . This is applied to all dimensions that have only one attribute (representing key as well). This dimension is referred to as flat and without details. The simplification of the flat references can be disabled by setting simplify_dimension_references to False in the mapper. In that case you will have to have separate table for the dimension attribute and you will have to reference the attribute by full name. This might be useful when you know that your dimension will be more detailed. 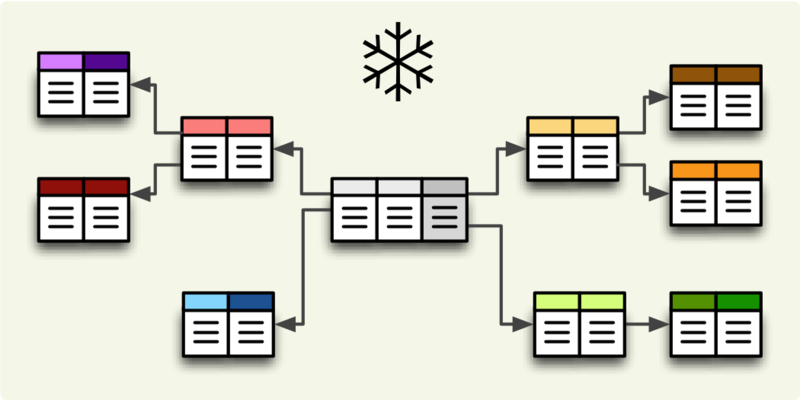 For databases that support schemas, such as PostgreSQL, option schema can be used to specify default database schema where all tables are going to be looked for. In case you have dimensions stored in separate schema than fact table, you can specify that in dimension_schema. All dimension tables are going to be searched in that schema. Following mapping maps attribute name of dimension product to the column product_name of table dm_products . Note that in the mappings the table names should be spelled as they are in the database even the table prefix is specified. Both, explicit and implicit mappings have ability to specify default database schema (if you are using Oracle, PostgreSQL or any other DB which supports schemas). Date datatype column can be turned into a date dimension by extracting date parts in the mapping. To do so, for each date attribute specify a column name and part to be extracted with value for extract key. According to SQLAlchemy, you can extract in most of the databases: month, day, year, second, hour, doy (day of the year), minute, quarter, dow (day of the week), week, epoch, milliseconds, microseconds, timezone_hour, timezone_minute. Please refer to your database engine documentation for more information. It is still recommended to have a date dimension table. From physical point of view, the data localization is very trivial and requires language denormalization - that means that each language has to have its own column for each attribute. In short: if attribute is localizable and locale is requested, then locale suffix is added. If no such localization exists then default locale is used. Nothing happens to non-localizable attributes. For such attribute, three columns should exist in the physical model. There are two ways how the columns should be named. They should have attribute name with locale suffix such as category_sk and category_en (_underscore_ because it is more common in table column names), if implicit mapping is used. 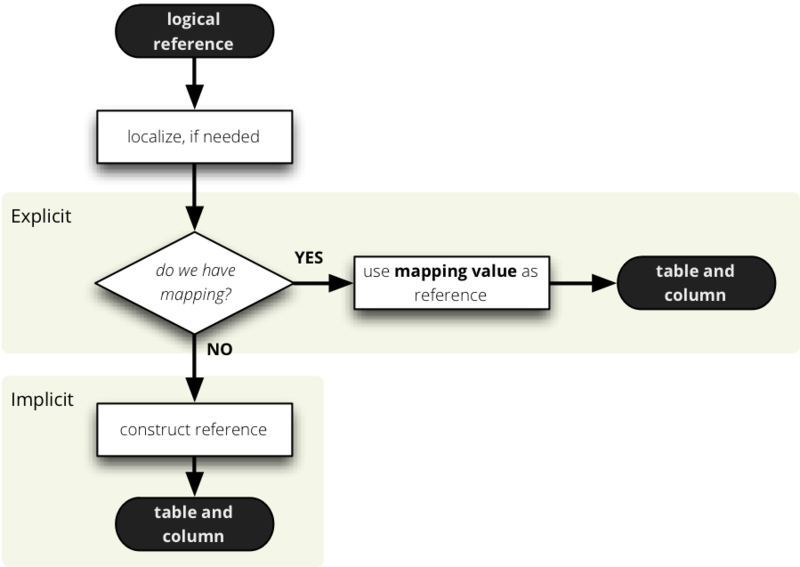 You can name the columns as you like, but you have to provide explicit mapping in the mapping dictionary. The key for the localized logical attribute should have .locale suffix, such as product.category.sk for Slovak version of category attribute of dimension product. Here the _dot_ is used because dots separate logical reference parts. Current implementation of Cubes framework requires a star or snowflake schema that can be joined into fully denormalized normalized form just by simple one-key based joins. Therefore all localized attributes have to be stored in their own columns. In other words, you have to denormalize the localized data before using them in Cubes. The “red path” shows the most common scenario where defaults are used. The SQL backend performs only joins that are relevant to the given query. If no attributes from a table are used, then the table is not joined. Joins are defined as an ordered list (order is important) for every cube separately. The join description consists of reference to the master table and a table with details . Fact table is example of master table, dimension is example of a detail table (in a star schema). Only single column – surrogate keys are supported for joins. Order of joins has to be from the master tables towards the details. What if you need to join same table twice or more times? For example, you have list of organizations and you want to use it as both: supplier and service consumer. Cubes supports three join methods match, detail and master. master – the master might contain more keys than the detail, for example the fact table (as a master) might contain unknown or new dimension entries not in the dimension table yet. This is also known as LEFT OUTER JOIN. detail – every member of the detail table will be always present. For example every date from a date dimension table. Alskoknown as RIGHT OUTER JOIN. When at least one table is joined using the outer detail method during aggregation, the statement is composed from two nested statements or two join zones: master fact and outer detail . 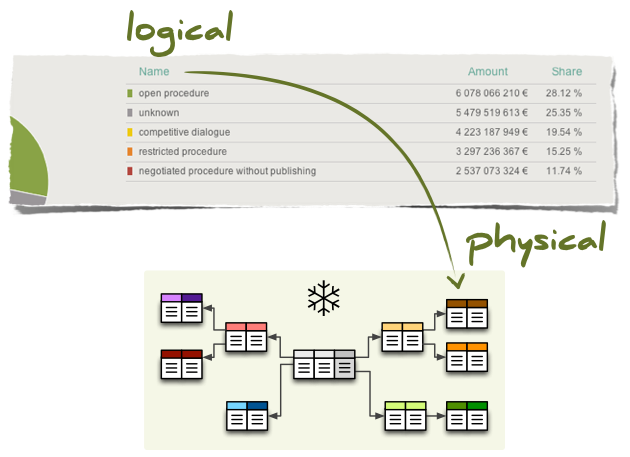 The query builder analyses the schema and assigns a relationship of a table towards the fact. If a table is joined as detail or is behind a detail join it is considered to have a detail relationship towards the fact. Otherwise it has master/match relationship. There should be no cut (path) that has some attributes in tables joined as master and others in a table joined as detail . Every cut (all the cut’s attributes) should fall into one of the two table zones: either the master or the outer detail. There might be cuts from different join zones, though. Take this into account when designing the dimension hierarchies.